6-speed manual, 6-speed automatic, CVT. 2.4-liter 4 cyl. 185 hp 181 lb-ft., 3.5-liter V6 278 hp 252 lb-ft. Forward collision warning, Honda LaneWatch, longstanding history of safety and durability. 103 cu-ft. passenger volume, heated seats, leather trim. 60/40 rfolding rear seat, rearview camera, 7-inch audio display. With changes to the hood, bumpers and features, the 2016 Honda Accord in Dayton, OH offers a number of appealing updates for drivers. The smaller of the two engine options also offers drivers a new increased level of fuel economy for highway driving thanks to a new lighter hood and friction reducing components. With these collective changes and the return of two engine options as well as many great features, the 2016 Accord is certain to impress drivers. With a new 7-inch display that arrives alongside the first offering of both Apple CarPlay and Android Auto in a high volume sedan, this Honda is leading the path to the new generation in infotainment options for drivers. Along with this new feature that allows for great connectivity, the sedan will now offer a 60/40-split that also happens to be heated on higher trim levels. The exterior matches the interior in terms of new and exciting features, which include the available 19-inch wheels, rain sensing wipers and parking sensors for an easier fit into tight spaces. 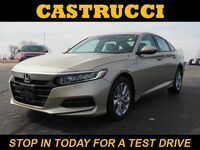 Interested in a 2016 Honda Accord? The two engine options remain the same for this model year with the standard 2.4-liter four-cylinder engine along with the 3.5-liter V6. Respectively, they produce 185 horsepower/181 pound-feet of torque and 278 horsepower/252 pound-feet of torque. The Sport trim offers a slightly increased 189 horsepower and 182 pound-feet of torque, but the biggest piece of news for the engines is the increase for 36 highway mpg to 37 for the non-sport trims with the 2.4-liter engine. 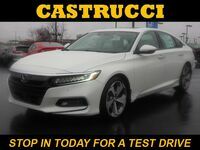 To go along with the engine options that the Accord offers, there are quite a few advanced safety features that drivers can add to the vehicle. 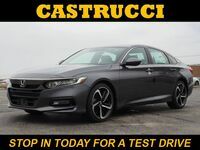 These include adaptive cruise control, Honda LaneWatch, forward collision warning, the collision mitigation braking system and a few more, making this version of the Accord one of the safest yet. To learn more about the 2016 Honda Accord you can contact our sales team by phone or online.